Sorry for the delay in posting an update today, I was busy spending time with family and with work. If I could only figure out how to make blogging about wildfires a career I could do this full time! Incident command has not updated the Google Earth overlays since Thursday, so we will not be doing a video update tonight, but hope to have one for you tomorrow. For the last video update please refer to the Crown King Gladiator Fire – Day 7 Update 2 post. Fire crews battled the fire hard today. There are currently 1,127 people helping battle the Gladiator Fire that started in Crown King a week ago. So far the fire has cost $7,066,469to fight. Luckily there were not anymore injuries today to firefighters so the injury count remains at 6. The fire is reported as 15% contained, but based on the most recent map that has been released, I would expect that number to grow tomorrow. The Gladiator fire has burned 13,953 acres to date. Overnight the fire did cross Senator Highway on its Western Flank, but air crews were able to keep it confined to a small area of about 40 acres. It appears that this section that crossed Senator Hwy has been controlled. This morning at approximately 2 a.m. the Rincon Fire Crew was forced to move to a safe area due to threatening fire behavior. The crew, a Type 2 Initial Attack Handcrew, is from Kernville, CA, off the Sequoia National Forest. 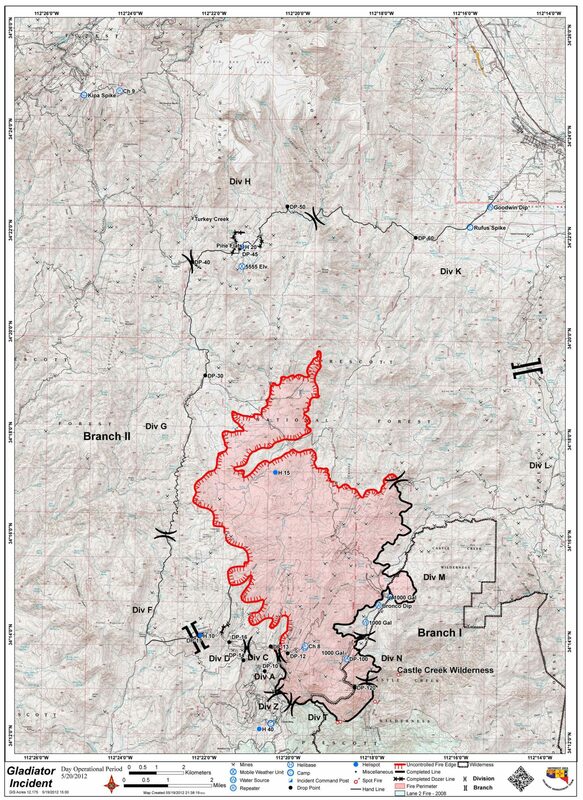 The incident location was near the Division C/D break, north of the community of Crown King, on the Prescott National Forest. At the time, the crew was building handline downhill and burning out the line as it was constructed. The wind shifted and the fire began to flank the crew. Observing that their position could soon be compromised, the crew exhibited good situational awareness and began moving uphill along their handline to a safe area. During this crew movement, the three crew members furthest downhill kept their tools and fire shelters but dropped their packs to hasten their ascent up the handline. None of the crew members sustained injuries. At the community meeting tonight, fire crews reported that 10 homes are currently being threatened near Towers Mountain. While we don’t have specifics on which homes, it appears they are the homes on the North side of the mountain between the Gladiator Mine and Towers Mountain. I know many of the owners of those homes are reading this blog, and I wish I had more information for you. All I can say at this time is that as long as the structures lost count remains at four your homes have been spared. I am hoping to find out more when the new map overlays are released. While the Gladiator Fire is still close to the Pine Flat area, commanders are calling that area “stable.” Which would indicate while the fire is not contained in that area, crews are confident that no homes will be lost there. In looking at the most recent fire map above, you will notice the solid black line along the Eastern side of the fire. This is the area that is contained. This is good news as this is also the area where the APS power lines run. APS should be on-site tomorrow to start preliminary efforts for reestablishing power to Crown King. Also on that map is should be noted that the area between Tuscumbia Mountain and Towers Mountain appears to be the focus of the fire crews. The last few days have been favorable weather conditions for the fire crews which has helped them get a better hold on the Gladiator Fire, but the coming days are expected to bring increasing winds. Again hopefully tomorrow we will have another video update of the fire. Thank you for your support for Crown King and the surrounding communities affected by the fire. We love reading your comments and always appreciate you sharing this page with your friends on Facebook. You are doing such a wonderful job! If I were you , I would look into Emergency management and information as a possible career. Thank you again for the very informative information. You are doing a great job in keeping us all informed. Our thoughts and prayers are with you all. God bless all the fire fighters. Thank you again!!! Feel better informed and appreciate all that your doing and Thanks to everyone who is trying to save our beautiful mountains. Great job of giving information. My son is the Superintendent of the Santa Fe Hotshohts and everyday I look for information on the wildfire where he and his crew are working. They are a Type I crew and usually do not come back to the fire camp but are spiked out for 7 days or more. I know he and his crew will do their best to help protect your community. I am praying for all the fire personnel and for all of you folks who live where these fires occur. Thank you for your updates. It sometimes seems as the media is loosing interest and giving less coverage. Although we are not in the path of the fire we have many friends that are and we are praying for all the home owners and fire fighters. I live in Prescott and the smoke has been visible here and I can smell the smoke. I’ve been watching the heavy aircraft and helicopters land and take off. I say a prayer with each one for all of you. Great updates. We’re not getting a lot of news here either. So thank you. May God watch over all of you and keep you safe.